People often assume that sweet wines are made for dessert pairings only, but there are a number of wines that have natural sweetness that also work well with main courses. The sweetness of a wine is not only determined by how much sugar is in the wine. Other attributes like acidity, alcohol content, and tannins can play a role in a red wine's sweetness. Inniskillin is Canada's original estate winery and has wineries in Niagara-on-the-Lake, Ontario, and Okanagan Valley, British Columbia. One of the products they are most known for is their selection of very sweet ice wines. Inniskillin has two versions of ice wine made from Cabernet Franc grapes. When used in ice wines, the Cabernet Franc takes on an almost strawberry-like flavor, sweet and smooth. The color in the ice wine comes from pressing only, as grape skins are not left on during fermentation. Inniskillin has won countless awards for their ice wines over the years. The 2008 Cabernet Franc Icewine won Bronze and the 2012 Sparkling won Gold Outstanding in the International Wine and Spirit Competition (IWSC), while Inniskillin was named Top Canadian Producer at the 2012 IWSC competition. The Cabernet Franc Icewine comes in three sizes. The most common ice wine bottle size is 375ml, and the 2015 vintage retails for about $100 a bottle, or you can try a smaller version in 200ml for just under $55. You can even find the 2012 vintage in a 50ml size for $15. Noval Black: It's said to be the best representative of the Noval style (terroir). There is no need to age or decant this port. Consider pairing with dark chocolate or drink alone, chilled. Aromas of dark fruits and butterscotch with black cherry flavors and a hint of chocolate on the palate. It received 91 points from Wine & Spirits and costs about $14. LBV Unfiltered Single Vineyard: This wine is like a vintage port with only noble grape varieties, but it's aged for four to five years in wooden vats versus the two years that is typical with vintage ports. LBV stands for Late Bottled Vintage, and while it's ready to drink now, it will still age beautifully. It's recommended to decant because it will help separate the sediment from the unfiltered port. Pair with dessert, dark chocolate, cheese, or enjoy on its own. Look for bright red fruits on the palate and a nice smooth finish. Expect to pay around $22 for a 2008 from Best Buy Liquors in New York who is able to ship to some states. Nacional Vintage: This wine is limited in quantity, and it's made only a few years in each decade. The grapes for this port come from the heart of the vineyard, in a small section planted with ungrafted vines which were untouched by the phylloxera epidemic. Cellar it for a few years -- they recommend drinking from five to 50 years after bottling, and decant it to separate the sediment. There's no arguing this is a stellar port, with various Nacional vintages earning 100 points from Wine Spectator and Wine Advocate. This is not an easy wine to track down, given its reputation and limited production. Wine Searcher gives a number of rare wine shop options, which can run an average of $1,200 for the 2011 vintage. Barefoot Wine only had four wines back in 1995, but today they have more than 30 different wines, including popular Barefoot Bubbly and Barefoot Refresh, which is a light-bodied spritzer. They are known for their inexpensive options, making them popular with the younger crowd, especially those just getting into wine. In 2005, Barefoot Wine became part of E & J Gallo Winery, which exposed them to a global market on six continents. They've been around over 50 years so it seems a lot of people love their inexpensive sweet wines. Wine Curmudgeon noted Barefoot Wines was the Number 2 best-selling wine in the U.S. at one point recently. Rosa Red Blend: Pair it with fresh fruit, light appetizers, or just drink chilled on a hot summer day. You'll find sweet jammy flavors on the palate and some hints of spice on the nose. It costs about $6 a bottle. Sangria: Instead of making your own sangria, Barefoot Wines offers Red Wine Sangria with lots of bright citrus flavors, like orange, lime, lemon, and grapefruit. It's great on its own, or try it with some spicy dishes, like Italian meatballs. You'll pay about $13 a bottle. 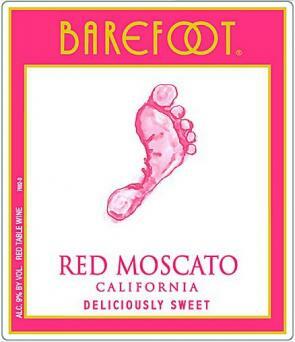 Red Moscato: Traditional Moscato is white, but Barefoot Wines makes a sweet red version with bright cherry and raspberry on the palate, followed by a citrus finish. It's easy to pair with a variety of dishes, but consider fresh fruit and cheese platters to let this wine shine for around $13. 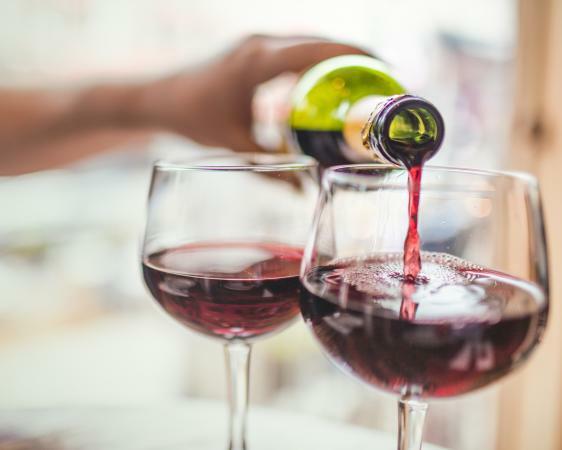 Sweet Red Blend: Probably one of the most popular Barefoot Wines, the Sweet Red Blend is made with a mixture of Barbera, Pinot Noir, Zinfandel, Grenache, and Petite Syrah grapes. These grapes typically produce jammy wines, and you'll get lots of raspberry, plum, and maybe some cherry notes on the palate. Break out the BBQ and try some grilled meats and veggies with this wine -- it can also stand up to some spice. This wine ranks in Influenster's top 20 wines with over 900 reviews. It'll cost around $13. Purchase Barefoot Wines at your favorite wine stores, since they are widely distributed, or look on Amazon, which is a preferred online retailer for Barefoot Wines. Lambrusco is a tough wine to figure out -- the mass-production Lambruscos in the United States tend to be ridiculously sweet. However, boutique winemakers back in Lambrusco's home of Emilia Romagna, Italy, work to break that stereotype by showcasing quality wines that aren't nearly as sweet as those you'll find on market shelves in America. There are some sweet (dolce) versions, but most producers aren't producing solely sweet versions these days. Lambruscos are fresh, and a good quality one is either frizzante (semi-sparkling) or spumante (full sparkling). They pair exceptionally well with the heavy courses found in the regions cuisine -- big plates of hard cheese, fatty meats, hearty pasta courses, and then main dishes if you still have room after all that. Locals in the region drink them with most meals, so aging is not part of the Lambrusco profile in most cases. However, if you grew up drinking Lambrusco in in the 1970s, you're likely thinking about sugar bombs that once dominated the export market. Riunite was one of those brands people mentally pair with the sweet Lambrusco craze of the 1970's, but it remains a strong selling brand. Banfi, the parent company of Riunite, is working to reinvent the brand to fit the new millennial marketing demographic, and based on big sales, people still like a slightly sweet Lambrusco wine in the United States. Riunite continues to be a powerhouse in the Italian export wine market, and they still win awards for their wines, including Critics Silver for the Lambrusco at the 2017 Critics Challenge International Wine & Spirits Competition. Riunite Lambrusco: The Riunite Lambrusco is a sweet red, semi-sparkling, made with Lambrusco Salamino, Lambrusco Marani, and Lambrusco Maestri grapes. It pairs with a variety of foods, as Lambruscos are meant to, but try something spicy which is where sweeter wines work well. Look for red fruit flavors on the palate and a bright floral nose. Serve slightly chilled. It costs about $7 at Total Wine. Riunite Blackberry Merlot: This is a sweet red sparkling wine produced in Emilia Romagna. As its name suggests, you'll get a jammy flavor of wild blackberries on the palate and fresh fruit aromas on the nose. Serve chilled and pair it with everything from light appetizers to dark chocolate and desserts. You'll pay about $5 a bottle at More Wines. Riunite Raspberry: This is also a sweet semi-sparkling red wine where red and rosé wines are blended with red grape juice and then natural raspberry extract is added. Floral and fruity notes on the nose with raspberry perfume from the extract. Lots of fruit and raspberry on the palate. Serve chilled and consider serving with fresh fruit and cheese plates or a dessert. It's priced around $8 at Gordon's Wines. Brands that produce predominantly sweet red wines are not necessarily plentiful. Many wineries may produce only a couple sweeter reds, unless they are a brand that specializes in dessert wines. Sweetness in a wine is also subjective, so when you find a wine you like, look at the grapes it is made with and the sugar content in the wine. You can then look for other wines that have similar profiles in hopes of finding other sweet red wines that satisfy your palate.